Establishing what kinds of opportunities to collaborate might make operational sense and why may lead to a strategic intent to engage with one or more others or a suggestion for enhancement of current practice. Engaging participants, determining where and when a collaboration may be supported may yield additional ideas to explore and identify the operational dynamics needed to activate the collaboration. 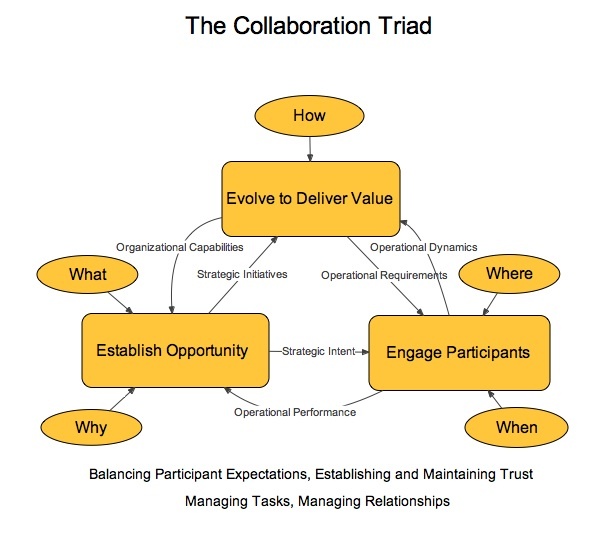 Most collaborations continuously evolve as the operational environment changes, requiring regular review of how the collaboration delivers value. As the collaboration evolves, enhanced capabilities may support new forms of collaboration and identify requisite changes in engagement arrangements.